Stephan Franck has already done quite a bit during a successful animation career. He co-created the Nicktoons’ Corneil and Bernie. He worked on films such as a Space Jam, The Iron Giant, and Despicable Me. He recently was nominated for an Annie Award for the animated short The Smurfs: The Legend of Smurfy Hollow. 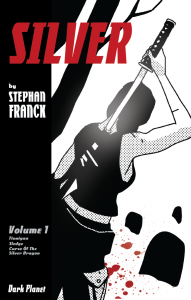 Add to Franck’s list of credentials the impressive Silver, a comic book he writes and draws that has seen its first three issues collected into a trade by Dark Planet. Silver Volume 1 begins with master thief James Finnigan attempting to steal a new treasure during an auction of items that belonged to the late Jonathan and Mina Harker (yes, that Jonathan and Mina). The burglary doesn’t go well, but luck is on his side and Finnigan counters every ill-fated moment with miraculous escapes. He ends up with Jonathan Harker’s journal—the one that recounts Harker’s encounters with Dracula—and a mysterious silver bar that happens to be part of a lost treasure. Thanks to the journal, Finnigan knows the treasure is hidden in an old Transylvanian castle. Now he just needs to assemble a team to claim it. Even in the most skilled comic writer’s hands, the three issues collected in this trade could have easily been compressed into a single 22-page comic. Thankfully, Franck allows each moment to breathe. Each small step becomes its own adventure, from the opening escapades to the assembling of a team. The expansion of these moments allows for characterization and increased tension. It also allows for reader surprise. There’s something truly amazing happening when you become engrossed in a story and then the narrative takes a sudden shift and you discover, while you really enjoyed the story up to this point, you want to read the new direction even more. It’s a feeling that’s rare in comics today—a rare feeling even in novels and films. Franck’s artwork helps set the tone in several ways. Black and white and slightly Mignola-esque in style, the illustrations create the heavy shadows needed for thievery, horror, and mystery. There is enough hidden with those shadows to make even the most dedicated wordsmith slow down and savor the art. But the two-tone panels also bring to mind old-time cinema: black and white adventures, Hammer monsters, serial reels. Not only is Silver a book you’ll want to read, but Franck’s story also acts as a textbook for aspiring comic writers and artists as well as those always eager to hone their craft. From pacing to dialogue—even incorporating character ticks (something not often seen in comics)–there’s a lesson on every page. But if you aren’t looking for some schooling that’s ok. Silver is going to entertain you. Parental concern: some language, violence. Josh Flynn (@joshflynn) is a writer and journalist. His essays, stories, and articles have appeared in Nuvo Newsweekly, Slam Magazine, NerdSpan, Punchnel’s, Mash Stories, and Two Clones.